If you work with colors—say, as a designer, Web coder, or app developer—you frequently need to find the exact color of a particular item or pixel on your screen. Sip 1.3.2 (Mac App Store link) is perhaps the easiest way to get that information. On initial launch, you choose your favorite color model/format from Sip’s systemwide menu. After that, you simply press Sip’s keyboard shortcut, or choose Pick Color from its menu, and you get a magnifying circle with a single-pixel “bullseye” in the middle for choosing the particular onscreen pixel you want to sample. (Sip lets you use one of three magnification levels.) Click on a pixel to sample it, and Sip copies to the clipboard the code for that color, in the format you’ve specified. Even more convenient: After sampling a color, changing the format automatically copies to the clipboard that format’s code for the most-recently sampled color—you don’t have to sample it again. 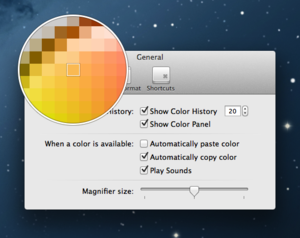 Sip offers a number of options for formatting color codes, and you can disable formats you never use. It’s a easy-to-use tool that makes quick work of an otherwise tedious task. It’s only major drawback is that if you have multiple displays, the magnifying circle works properly only on your primary display. An easy-to-use tool for determining color information.